We can all lose weight on fad diets, calorie restrictions, fasting etc. For many women the scales are what keep them on track when watching their weight. However, what you are losing is both muscle and fat. The goal of successful weight loss is to preserve as much muscle as possible or gain some, while at the same time lose as much body fat as possible. Your body fat is a key indicator of success, NOT the scales. Don’t depend on them for measuring progress. A scale can’t tell you if your clothes fit better, it can’t tell you if your body fat percentage has changed, and it definitely won’t tell you if you’re looking any better. A few of my clients are making progress but their scale tunnel vision blinds them from seeing it. But they are feeling more confident, looking better in their clothes and feeling better about themselves and to me that is progress. Progress is not just measured in pounds lost. ‘Patience and consistently are key to long term success’. This table shows why you should be focusing on FAT LOSS not WEIGHT LOSS. 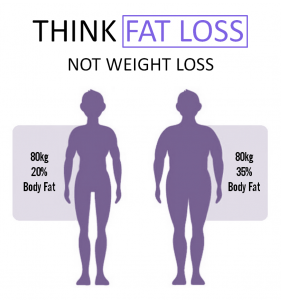 SAY NO TO WEIGHT LOSS… AND YES TO FAT LOSS! We certainly aren’t talking bodybuilding here, don’t panic! The more muscle you have, the more fat you burn, the slimmer you look. It really is that simple. Muscle boosts your metabolism and it burns fat during the day and at night when sleeping. If you lose 20 pounds but 10 pounds of that was muscle, that’s not a very successful weight loss attempt. Yes, you’ll be smaller, but you’ll also have a slower metabolism, will be weaker, and might even have a worse body composition than when you started. Body composition matters the most. By this I mean FAT. 90% of my clients come to me wanting to shift the extra bulge around their middle. This is one of the most crucial measurements (done around the belly button) as it can indicate serious health problems such as type 2 diabetes, chronic heart disease, stroke and certain cancers. Another reason to lose the fat. Don’t try to lose weight too fast. Aim for 1-2lbs per week of fat not muscle. Think of it as a long-term life style change as opposed to another crash diet. Eat protein with every meal. It’s great for muscle repair and cellular regeneration. Avoid protein shakes (unless you are a bodybuilder) and stick to real foods such as eggs, chickpeas, white meats. Prioritise strength training. Compound exercises like the bench press, squat, deadlift, and rows will most efficiently build muscle. You don’t want to be losing strength during the weight loss process. I urge you to change your focus NOW and trust your PT, you may be leaner, happier, and stronger for it!